Published: April 24, 2013 at 02:34 p.m. Updated: April 24, 2013 at 04:42 p.m.
Former LSU cornerback Tyrann Mathieu just can't seem to stay out of the news as the 2013 NFL Draft approaches. 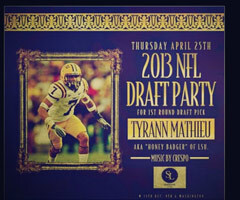 One day after a story surfaced that he missed two meetings with NFL teams because he was sick, Mathieu tweeted out an advertisement Wednesday for his draft party, which will be held Thursday night. We love the confidence. The party is held on Thursday night and it calls Mathieu a first-round pick. "I didn't say i was going 1st round.. I Did not approve that part of the flyer..." Mathieu wrote after the flyer had been up a few hours. He also wrote: "Smh they just be looking for stuff." Party promoters often use a player's image and presence to advertise parties in exchange for a fee. Sometimes the promoters use a player's name even without their permission. The difference in this case: Mathieu himself sent out the party invitation. Taken in isolation, the party and the missed visits aren't big deals. But this is not the type of attention Mathieu wants before a team takes a chance on him. This is not what NFL teams want to be reading about during draft week. And you can be sure they are paying attention.